I took some time this afternoon to upload a new set of fine art digital prints to the online art shop. Some of the new prints are part of the Space Loops series I wrote about in my last post. The store now has 14 prints and 6 paintings. As far as prints are concerned, I’ve tried to blend minimal “hard-edge” designs with the funkier stuff. Some prints are just ideas on paper; they may become paintings, they may not. Time will tell. 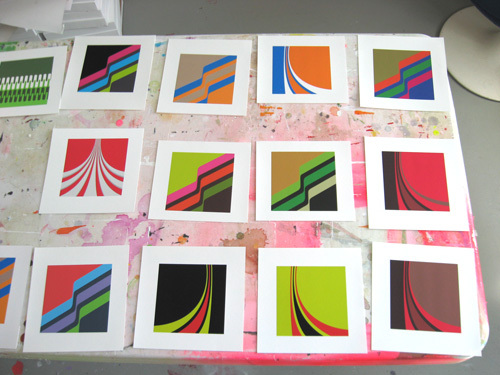 I’m enjoying making the prints — testing color combinations, giving designs a life beyond the screen. The process is liberating. Photographing them is a bit trickier, but I’m not giving up!